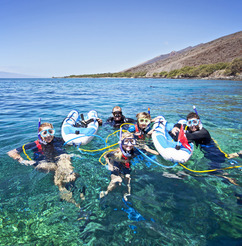 The Maui Magic offers you the excitement of SNUBA as an option. SNUBA is easy, fun and safe... Almost anyone can do it! SNUBA is only $59 (plus tax), payable to the instructor.. We recommend that you reserve this option in advance as there is limited availability. There is no obligation to SNUBA should you change your mind once on the boat, but it will put you first in line. snuba is easy, fun & safe! Don't miss the opportunity of trying the exciting world of SNUBA! 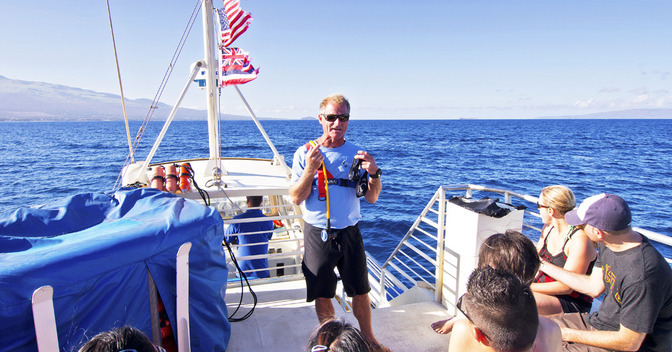 This exhilarating experience can be added, for a nominal charge, to your Maui Magic adventure. While the boat makes way to the daily snorkel destination, our professional diver/instructor will guide you through a short (usually only 15-20 minutes is needed) onboard instruction - lesson in the use, techniques and procedures of SNUBA. 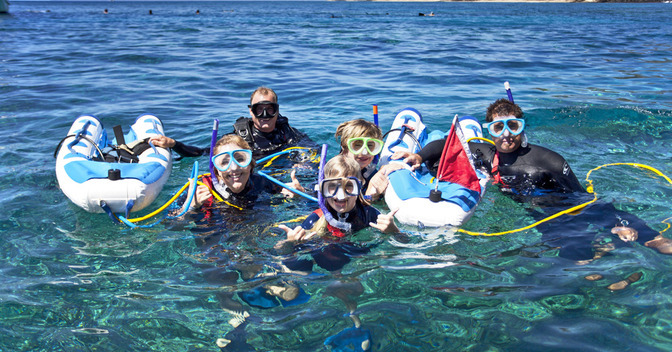 When you arrive at the snorkel destination, you are ready to get wet and start your SNUBA fun! 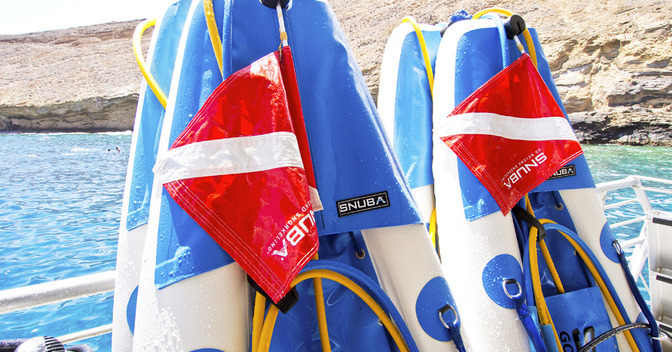 Our SNUBA experience (in the water) lasts approximately 20-30 minutes. It is safe and you are not alone when you go! 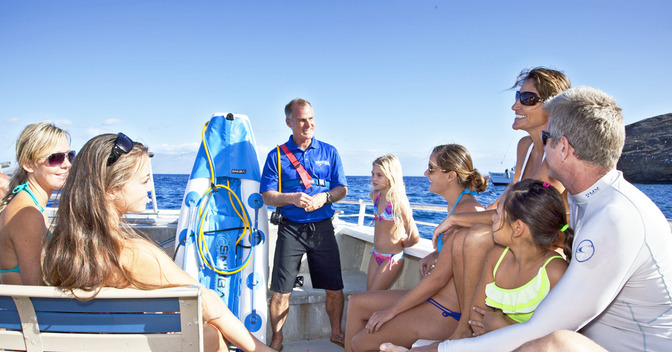 You are actually accompanied by a Scuba Diver - Instructor that is dedicated to overseeing your safety and assistance. But, the Scuba diver is not just there for your safety... They are also there as your personal underwater group guide. They will point out and even introduce you to many of the wondrous marine life that live at these destinations. 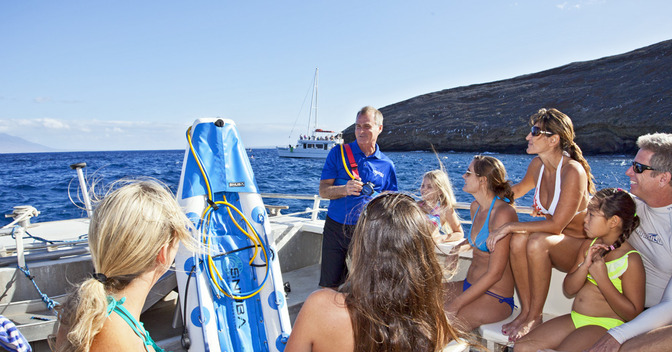 Since most or Maui's snorkel sites have depths of 10 - 35 feet, SNUBA is a great way to really see all of the marine life that abounds under the surface. So, while most others are snorkeling on the surface, you can be one of the lucky few that are right in the middle of all of the wonderful sights and up-close to see turtles, colorful corals, colorful fish and other exiting forms of marine life. 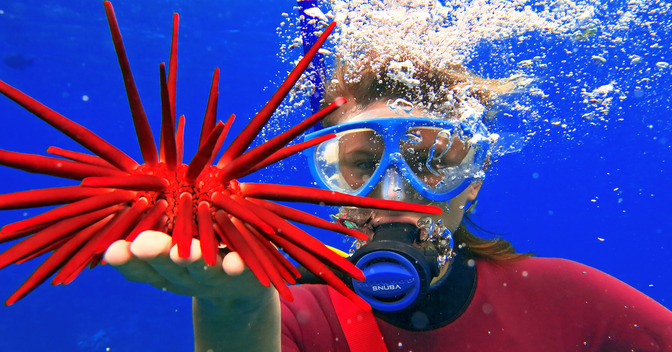 You really get the most of any snorkel destination with SNUBA! 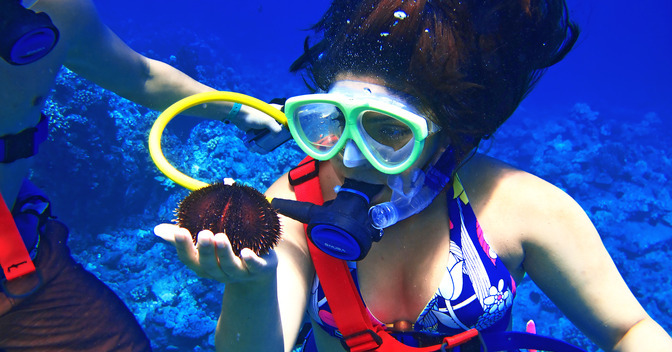 Plus, we still provide you with enough time to snorkel too! SNUBA was created for those who enjoy the simplicity of snorkeling and would like to experience the wonders of breathing underwater. 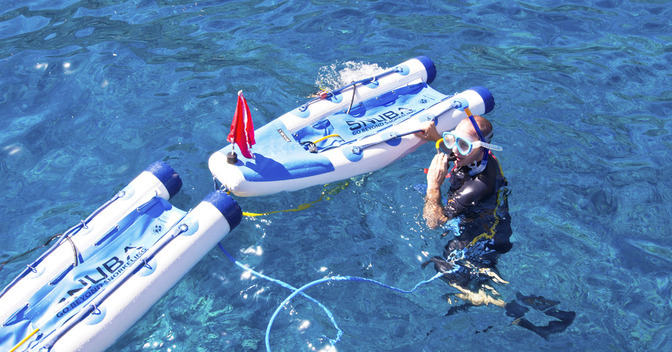 SNUBA is a unique, patented, shallow water, diving system that bridges the gap between snorkeling and scuba diving. SNUBA is safe and easy and does not require certification. 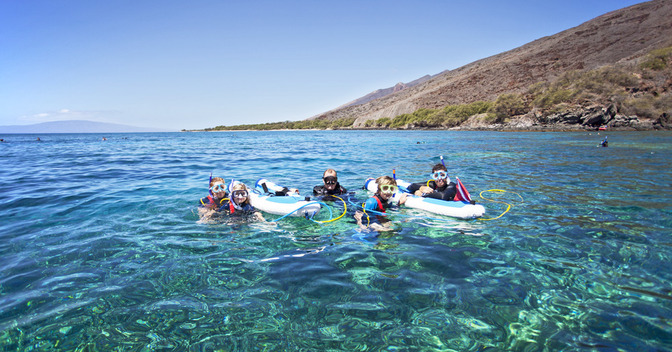 Our SNUBA program only requires strong swimming skills and previous snorkeling experience is helpful. There are some medical conditions that may preclude being able to SNUBA. So, you should discuss any concerns which you may have with your SNUBA instructor when you are on board the boat. It is easily accessible to couples, families, children (8 years and older), and even seniors. This is truly a unique experience to try! SNUBA is quite a bit different from scuba! Although they both share in providing you the ability to breathe underwater, SNUBA does not have the learning curve or equipment issues of its distant-cousin, Scuba. 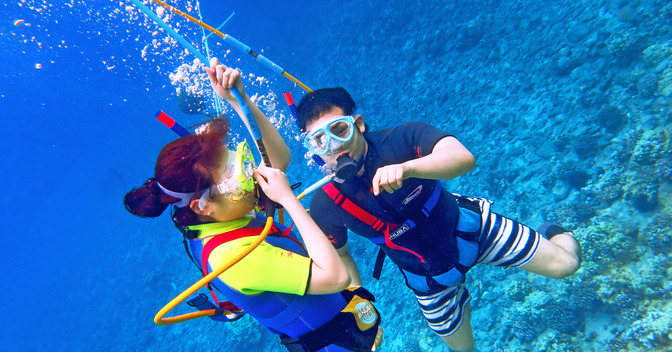 SNUBA divers breathe underwater by means of a long air line which is connected to a standard scuba tank. The tank is mounted on a raft that floats on the surface that follows your every movement. During the dive you are never more than a few feet from the security of the raft floating on the surface. The air line is secured to your body by means of a special harness that you wear that prohibits the regulator (or mouth piece) from pulling away from you. The airline allows you to tour underwater near the bottom, at mid-water or on the surface depending on your level of comfort. 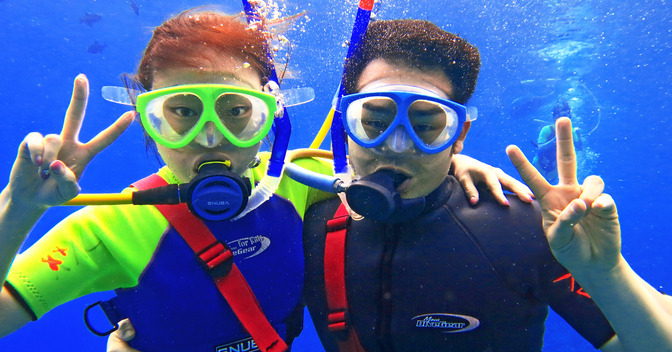 There is absolutely no heavy or cumbersome diving gear that you have to wear. Plus, there is none of the classroom or studying necessary like in SCUBA. 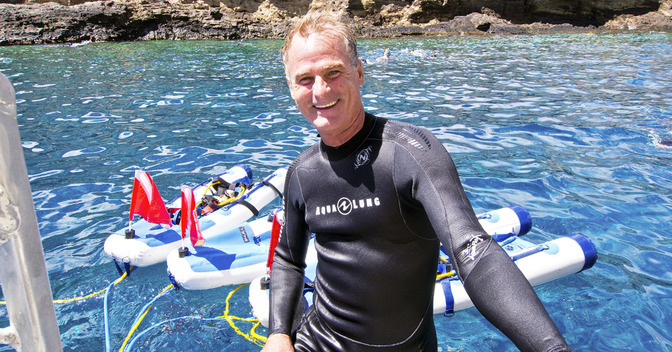 Within minutes, anyone (that is willing and able) can be on their way to enjoying the exhilaration of breathing underwater and enjoying the sights that are missed when snorkeling. 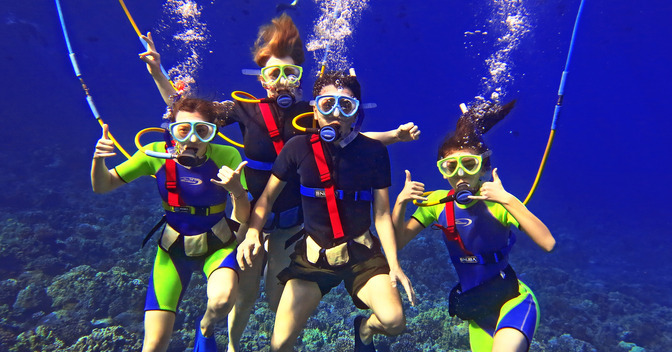 You will really get the most out of any of the snorkel destinations that Maui Magic services and enhance an already amazing experience even more when you choose SNUBA as an option. The reefs we SNUBA at have beautiful and abundant marine life and so much of it is below the surface (at depths of over 10 feet) of the water where the average snorkeler cannot reach on a single breath of air or stay down for an extended period of time to really enjoy it. 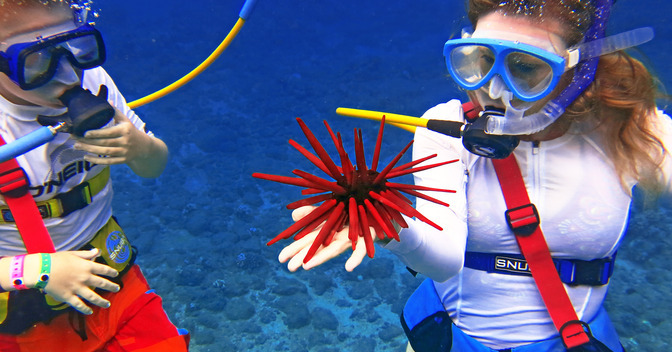 Discover the exciting underwater world of Maui with the ease of SNUBA. It is safe, fun and easy to do! 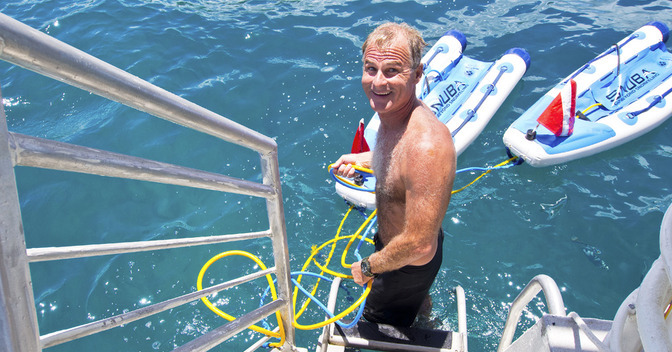 SNUBA sells-out quickly once people see just how fun and easy it is. So, be sure you reserve your SNUBA adventure ahead of time. 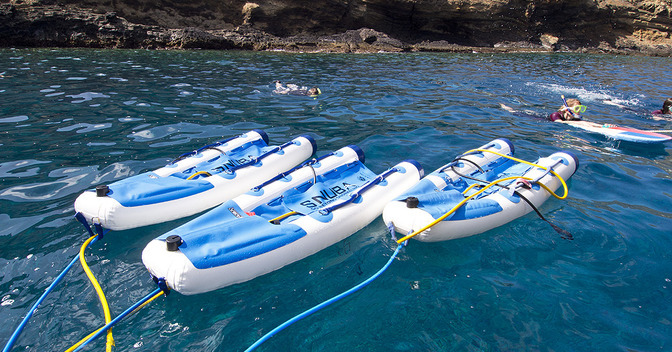 This way you'll secure the opportunity, and not miss out, since SNUBA is limited to small groups (2 separate groups of 6 for a total of 12 people) on each daily charter. 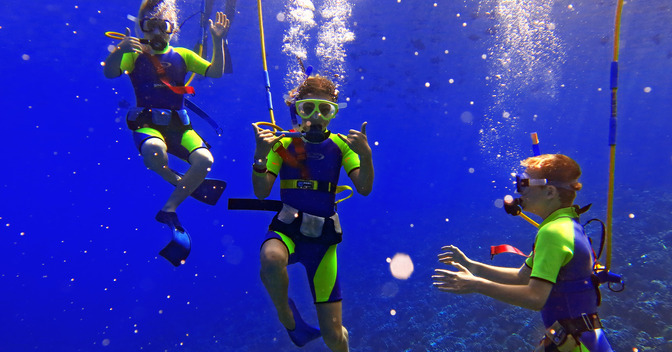 Because SNUBA requires more details when booking, you must make note of it when booking online or call 1-800-736-5740 to reserve your SNUBA experience and add it to your Maui Magic snorkel adventure. There is no prepayment required and there is no obligation to purchase. Payment for SNUBA is processed by your instructor onboard the boat, and he or she accepts cash or most major credit cards. Since SNUBA is very popular and tanks are limited on each trip, be sure to reserve your SNUBA experience before you arrive!